The market for Intelligent Virtual Assistants (IVAs) is exploding, projected to grow from $400 million in 2015 to over $3 billion by 2020*. As IVAs become more and more common in our daily lives, the need for standardization becomes increasingly important, especially in the ways our IVAs communicate, both with users and each other. 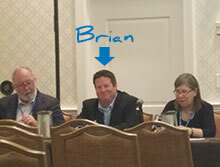 Developing such speech standards for Intelligent Virtual Assistants was the topic of a recent panel discussion at SpeechTEK 2016 in Washington, D.C., which included our own Brian Susko, Senior Software Architect at True Image Interactive, as well as two other industry thought leaders, James Larson, SpeechTEK Conference Chair, and Deborah Dahl, Principal at Conversational Technologies. Past & Present Speech Standards: What is common now? State Chart XML (SCXML), a commonly accepted method that allows applications to store state or context for use in process orchestration. For example, if multiple sign-offs are required on a document, SCXML uses variables and states to send the document to each required signee as each adds his electronic signature. Future Speech Standards: What should we consider as the IVA market grows? To make room for the growing market, including use cases across a variety of industries and applications, the panel discussed how future speech standards for Intelligent Virtual Assistants will require standardized communication through a common interface, or “Gateway IVA”. Today, individual platforms must be manually “linked up” to another platform in order for them to talk, dramatically hindering scalability. This trusted Gateway IVA would only speak with other previously registered IVAs, allowing trusted IVAs to communicate instantly and eliminating the time spent managing and configuring multiple applications. Should there by a single registration repository for trusted IVAs? How will trusted IVAs discover one another? How should we build on existing speech platforms? A consortium was formally organized at the conclusion of the panel to further the conversation, and we look forward to partnering with others in our industry to develop thoughtful best practice speech standards that help create truly seamless omni-channel user experiences. Jim serves as Chief Operating Officer of True Image Interactive, where he leads our professional services and customer support teams, as well as oversees daily operational activities. Jim has over 15 years of experience in leading professional services teams and organizations across numerous industries, including transportation, pharmaceutical, retail, finance, manufacturing and the public sector.